A dog that disappeared almost five years ago has been reunited with its owners in time for Christmas. 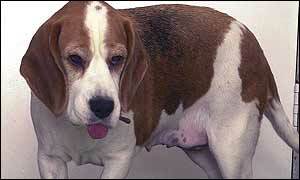 Droopy the beagle went missing from the home of a Tipton family in May 1998. After fruitless searches and a poster campaign, Stuart Stanford and his mother Joyce accepted they would never see their beloved pet again. But the Stanfords have now had a telephone call telling them Droopy has been found wandering in Northfield, Birmingham. The RSPCA had been able to identify the animal because of a microchip Mr Stanford, 27, had had fitted when the dog was a puppy. The electronic identity tag was inserted under Droopy's skin enabling him to be identified if he went missing. Speaking to BBC WM, he said: "On Monday night the Harbourne RSPCA phoned me up and told me, 'we've found your dog'. "I thought somebody was winding me up. "I thought she was on about Bruce, who was down the side of my mum's house. "I didn't realise it was actually Droopy they found. "It was like somebody bringing somebody back to life, really." A spokeswoman for the RSPCA said the Stanfords' reunion with Droopy highlighted the importance of microchipping. "We are always encouraging everyone to have their pets microchipped. "This dog was missing for a particularly long time and it's incredible that the owner has been traced." "Her owners are convinced she was stolen"
Should all dogs be microchipped?